How does it work for you after you see a recipe, think you might like to recreate that recipe, finally collect all the ingredients for that recipe then actually cook that recipe? For me it's a lonnnng, lonnnnng, did I say long? process. No joke, years can go by before I actually get to coordinating and cooking recipes. For example, the bean sprouts for this Egg Foo Young recipe literally sat in my pantry for 3 years (did I just confess to that?) before the sprouts became Young. Or take that time I was served Herb Marinated Shrimp Wrapped in Basil at Travis' mom's house, had the cookbook with the recipe at home, wanted to make it, but yet, 2 years passed before I finally made it my own. You get the point. I have a knack for drawing out my timeline to test new recipes. However! None! And I mean NONE! of that happened with Momofuku Compost Cookies. My definition of cookies will never be the same. Imagine, me: zombie-like browsing blog upon blog, staring at cookies, pancakes, brownies and other carbs when I just happened upon this blog, saw the word Momofuku - which I knew was some fancy and exciting restaurant in NYC - but being mostly contained to the Midwest I had no idea what Momofuku really meant. My life has changed. I needed to know more. I needed to smell these. I needed to eat these. I needed to know everything Momofuku. So, of course, I immediately checked my local library out of all cookbooks that I could find when it came to Momofuku. I was urgent! I then commenced upon scouring the interwebs for all versions of Momofuku Compost Cookies. All in the matter of 2 hours, mind you. After a little bit of research on the ingredients and method, I settled on this version. These cookies were so intriguing that I baked them within 24 hours of seeing the initial inspiration. Jump to 3 days post-cookie baking madness and they are all eaten. People - you need to make this cookie - it's so fun because the method is madness - it's a garbage cookie. Consider it perfect timing because you can rid your pantry of all that Valentine's Day candy your sweet kiddos haul home and get yourself ready for Easter candy (what is it with candy holidays?). 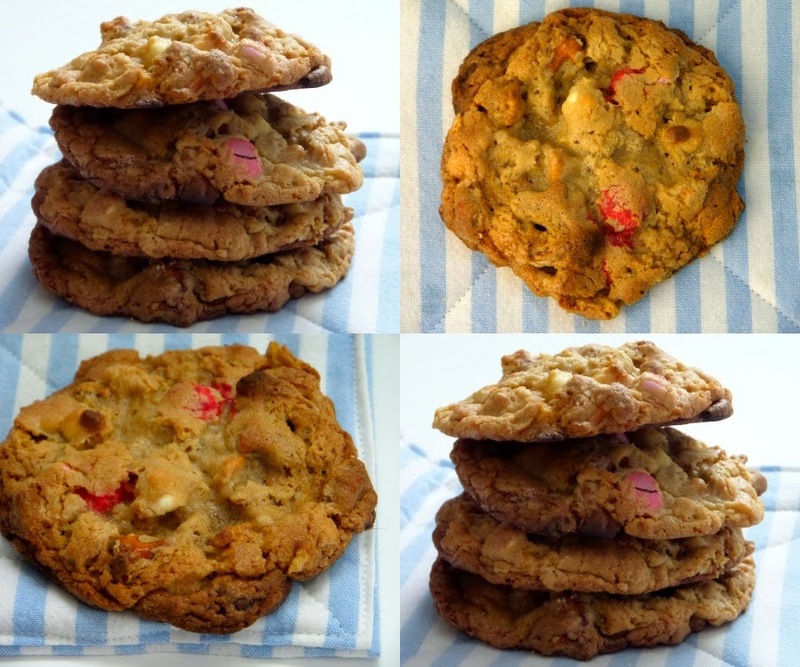 I now fear no Candy Holiday because I have this ammmmmmmazzzzzzzzinggggggg cookie recipe to make all pantry junk into addictive, buttery, crispity, chocolatey, salty, eat me every day, 3 times a day cookie love. And I mean pantry junk. See those potato chips? They are the grossest, blandest, no one is going to eat those, how can you call these poatoe chips, type of potato chip. See those pretzels? They sat in my husband's fish house for 5 months. Cloak those chips and pretzels in butter and sugar paired with a chocolate trifecta and you are going to want to drop everything to eat those chips. Get out your stand mixer. It's kinda a must-do for this recipe because you're going to be running it for 10 minutes. If you don't have one - well - you should just quit reading right now but I know that's impossible because you're going to dream about these cookies until you eat them. I know. It's OK. I do it, too. And cream. Your sugar and butter, that is. For a long time. 10 whole minutes. Set the timer. Just do it. And your creamed butter and sugar doubles. And it's like whipped cream, but dreamier. Is that even possible? Now add your flour. Only stir for 30 seconds. Promise? And the garbage. Any salty and crunchy snack. Goldfish, bugles, pretzels, corn flakes, rice crisps, chips, pickles. Just kidding. Any chocolaty snack. Chocolate chips, white chocolate chips, butterscotch chips, peanut butter chips, M&Ms, Hershey kisses, Rolos, Kit Kats, Reeses PB cups. All. Of. It. Using a ice cream scoop to portion onto lined baking trays. Here is the most important part: Freeze your cookies on the baking tray for one hour or more. If you do only one smart thing in the kitchen for the rest of your life, this will be it. Cooking Notes: All the candies and salty things are interchangeable and very versatile. Just use about the same proportions. The original recipe called for light brown sugar, but I used dark because that's what I had - I don't think the final product was affected - so feel free to use them interchangeably. The coffee has to be freshly ground beans, no wet, used grounds or no instant coffee either. Measure the butter, sugars and corn syrup into the bowl of a stand-up mixer fitted with the paddle attachment and mix at medium speed for 2-3 minutes until combined. Add vanilla extract and eggs and beat at medium-high speed for 10 minutes, set the timer. Scrape down the sides at the halfway mark. Add in the flour, oats, baking powder, soda, and salt. Mix for 30 seconds. Coarsely chop the pretzels and potato chips. Add in pretzels, potato chips, candies, chocolate chips and ground coffee. Mix for 30 seconds. Using a large ice cream scoop to measure out the dough, scoop onto a parchment lined baking sheet, placing cookies 4" apart. Freeze for one hour, or up to a week, until firm. Preheat oven to 400ºF. Bake frozen cookies for 10-12 minutes until brown around edges, and just baked through in the center. If the cookies looked pale upon coming out, bake for an additional 1 or 2 minutes. Remove from oven and cool for a couple minutes on the baking sheet. Using a spatula move to a cooling rack and cool completely. Store on the counter for 5 days or freeze for up to 3 months.